Consolidate vitamins and other daily medications into six roomy compartments and eliminate the need to tote around multiple, hard-to-open bottles. Plastic dispenser is 4" tall. Have been using these for years! Great to keep daily pills organized! easy to use and to see how many pills are left so you can reorder. I like it, saves space too, in medicine cabinet. I get pills for 3 months at a time and also monthly. I had so many different sizes of bottles to open to fill my daily pill dispenser (weekly). This puts everything organized and easy to see when I need to order. I can take with me on trips easily. Just one container and 6 of my pills. It is great. I'd like to see one taller and holding more pills. Vitamins are always so large. The remedy for difficulty removing bottle tops is to clean both contact surfaces and then rub them with a small amount of vegetable oil. This must be repeated every few months. The best pill dispenser you can have. My friend and I have had one of these dispensers for many, many years, his being taped, glued, etc. They are hard to find, so we were excited to find them on your site. your company. The pill organizer is quite unique. I have 7 prescriptions but this only holds 6. I still use it and I put a label on top of it to remind me to get the extra one out. I fill out a weekly box for am and pm works great. It actually holds a good bit of pills ... even the larger pills/ vitamins. Nice and compact. I was plesantly surprised. Of course .. sometimes the gel pills get a bit sticky in the bottle. Very handy. Better than a lot of bottles sitting around. It will be great to have all our pills in separate parts of this container rather than having all in one bottle and having to separate each night. Also much better than taking each bottle of medication when traveling. Will not take up anywhere near the space that separate containers take. I purchased this pill organizer for travel, but ended up using it on the dining room table at home every day. I never forget to take my vitamins with this convenient pill organizer keeping all of them together. I may have to order another, smaller one if they are available, for travel because this one is perfect for home. Glad to see you still had this item. We keep everything organized with this pill box. It is eazier than opening six different bottles every day. Been wishing for something like this for some time. So glad I finally found this item. Others on the market only hold enough for a week, one day at a time. This pill pot holds the whole bottle of 6 different pills or vitamins. Finally got all that clutter off my kitchen table and now all are contained in this one pot and good for the month or more. I'm extremely happy with it. Very sturdy & does the job. Easy to fill & dispense. a great value, [...] for a very handy item to keep your meds, OR vitamins all in one container, not having to open many bottles at a time. I LOVE IT! This is great however it was way to big for what I wanted it for. Think I will use it for spices in my motorhome though. It holds a lot in each compartment. I HAVE MANY OF THESE FOR MY VITAMINS.I HAD TO BUY A REPLACEMENT ,BECAUSE THE OPENER BROKE OFF.HAD FOR MANY YEARS.LOVE THESE BECAUSE YOU CAN USE FOR MANY THINGS.. THANK YOU,WILL BUY AGAIN.. Thrilled to finally find another one of these. Better than the old one as can load 2 compartments at same time with out having to turn the top. Just line up opening with the divider in the center. Is a little hard to turn the top but it's new and not worn in yet. Very happy with item. If you are someone who has a ton of pills vitamins to take daily, BUY THIS. I have used several different types of daily pill holders, but the problem is you can only put one or a few types of each pill. I would forget to refill the holder, and then forget to take my vitamins. With this I can put 30 or more of each type of pill. I don't have to remember to fill the container on a weekly basis, and I don't have to have tons of pill bottles on my table, It's easy to grab and go, too, if you need to take it somewhere. I am happy I bought this. This is the 2nd one we’ve purchased. It is convenient, sturdy & the labels end any confusion! This 6 section pill case is perfect for our vitamins, supplements & meds. Easy to use & fill& durable. Best thing to keep your pills in order, organized and on hand. Love it. Large size...much more convenient than all the small pill containers! I am disabled and take a lot of pills and vitamins to try to stay healthy. This was a good way to save some space and tell if I needed a refill. Everyday use to keep medicines easy to use. Love this product, instead of multi bottles on table I have only 2. This stores all medicines that I need to take daily. I have one for morning meds and one for night meds. I used a sharpie and wrote am and pm on the top for even more convience! They sit on my night stand and it makes it so much easier to remember my meds. They take up about 4 inches of space only and is so much better looking than all those bottles spread out. I did write the prescription# on the labels making it just as easy to order refills since I then threw out the bottles. I got 2 for my 88 year old mom and they make it easier to keep track of her meds too. Today I am ordering for my husband! I'm an RN and recommended these to my patients! I bought one years ago and it finally broke at the hinged latch, which should be made sturdier if possible. Otherwise this is a handy item to have...saves lots of room on shelves. 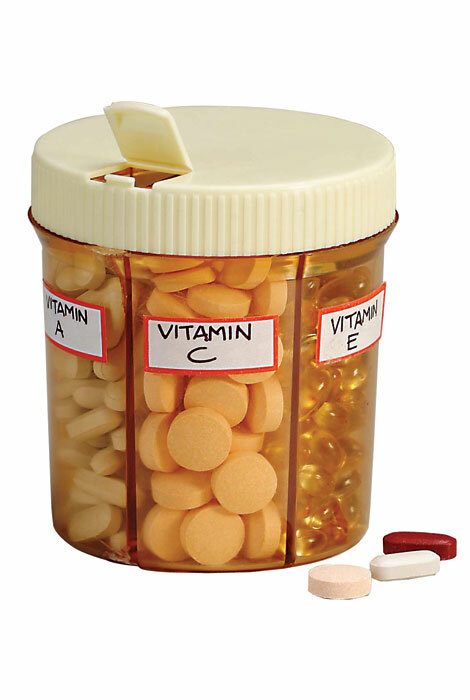 Vitamins keep fresh longer and you can see when you are running out. Great item!! Good product. Great space saver!! Can keep in plain sight so I can remember to take all my medicines! We love this product both my husband and I have one and use all the time. Can put my pills that I usethe most in it. Great product even for other items to be used. Keeps pills separated and easy to use. The only difficulty is that sometimes the top is difficult to turn. This organizer is just what I needed to organize my large vitamins in one container. It saves me searching time in the morning. Great for organizing vitamins and keeps everything in one place. Absolutely love the way I can organize my vitamins and everything is easy to see. I take a variety of vitamins and minerals every day. On my kitchen counter I've replaced 6 bottles with this one convenient container. It's ease of use assures I won't ever be tempted to skip my nutritional supplements. Best not to overfill as the pills don't come out easily then. I originally purchased two 6-section Pill Organizers. One for me and one for my nephew. I take 6 different kinds of pills but my nephew takes 11 so he needs another one. I use this item to store my medication instead of keeping 6 bottles, I only have to keep one. Then I refill my weekly container (Mon,Tues,Wed,Thurs,Fri,Sat,) so I can keep track of when to take what. Good product comes in handy to store and dispense vitamins and other pills. I have 6 of these. I gave 2 to my elderly mother. And my husband and I use the others, for vitamins, and prescriptions. It makes it easier to keep track of taking pills. You can see when you are getting low. Keeps everything compact. Works great for very small pills to large vitamins. Most useful for twice daily pill use! This container can hold days worth of vitamins or medications. Great for vacations or multiple users. I can store all my medications in one container, making them easily accessible. Simply flip up the tab and tilt the container. No more pills spilling out of my hand or into the sink. No need to struggle with child proof caps, and no moisture getting into the pills because the container can be tightly closed and easily opened. The container can be packed in carry-on luggage with little concerns about it "popping open" as the flip-top does require some pressure. If you take a lot of different vitamins or pills and don't want to open a bunch of bottles everyday, this is what you need. Can't beat the price either. I use this product to put all of the pills in it that i use on a daily basis. The labels make it easier for me to figure out which one i have used and which one I haven't used. It is the greatest thing since sliced bread. I don't have to open every single bottle, I just turn and wala!!! I bought this pill organizer over 5 years ago and use it daily for my vitamins. It is so easy to fill it up & take it to work for the week so I remember to take them everyday. I am surprised by the durability of this thing. I use it every day & have even ran it through the dishwasher a couple times and have never had any problem with it. I have since bought several more as gifts for people who see mine & want one for themselves. A lot of times I would forget my morning pills. But now I dish up my morning supper and night. If I don't see the supper I know I didn't take them. It has really helped me. If I had to say something I don't like about it. I would say when I go to refill it I feel like I'm going to have pills all over my room. It is so hard to get the cap off and I'm 44. So I just fill it through the little hole. Problem solved. It takes longer, but you don't have to worry about 1,000 pill pick up. This product is great for someone like me who needs to be reminded to take vitamins. By having all my vitamins and medications in this one container, I don't forget to take them any more and it cleared up quite a bit of space in my cabinet because I was able to eliminate 6 pill bottles - which I recycled. Great product and if I travel, I just grab it and go - I will always have enough for any trip! Bought this for my husband. He is on many medications. He loved it so much he asked for another one. Very convenient. This is a great solution to clutter on your table. Instead of 6 vitamin bottles, now there is just this one! I bought one for myself 8 years ago and am still using it. I travel a lot so it's easy to toss the bottle in my carryon and not have to worry if I have enough meds to last if I extend my trip. I just ordered 2 more for a friend who takes multiple meds (1 for a.m. and 1 for p.m.) and spends hours sorting pills for the week. Found this very helpful when my husband and I were on a 20 day trip. This container has allowed me to get 6 bottles off my table. I will also use it for travel, much better than my daily travel pill holders. this product is great for vitamins and suppliments. the opening is on top which makes it easy to get pills out. we had our last one for over 10 years. I purchased two of these - one for morning pills and one for night pills. I love them! These are going to make traveling so much easier. I also love that when one of them arrived damaged Miles Kimball took immediate steps to rectify the situation and I had a replacement very quickly. have one like this but wanted another plus one for brother , thank you very much . One of my best purchases ever! This wonderful container replaced 6 individual bottles of pills and, thereby, reduced the "clutter" on my kitchen countertop! Such a handy item! I love it and use it daily! Each compartment is large enough to hold a weeks supply. Will help to declutter my counter. When I brought my medicines for an office visit to see my doctor, she thought this container was great! Asked where I found it, as it would be useful to her older patients, too. I use one for my own personal meds and another for the family's vitamins. Keeps me organized, aware of when I need refills, don't accidentally forget to take a med, great for travel (don't have to take a bunch of separate bottle or count the number of each kind of pill,I will need while gone). My husband uses it to hold nuts and bolts in the garage. My daughter uses it to hold beads for her crafting. I use it to hold my medications. I often visit my son on short notice, and I grab the holder and go. Much easier than grabbing 6 different medicine bottles. I also use one to hold different small candies. I keep it in my nightstand for a treat before bed. Also Holds buttons and different size safety pins. I would buy this 6 section pill organizer again! I actually ordered 2 of these 6 section pill organizers. It's good to have a spare 6 section pill organizer since one of them could break and you will need another one to hold your vitamins or medications right away. This item is great to have and does hold your vitamins or your medications so I highly recommend this pill organizer. My charge card was hacked when I made this order...needless to say I was quite upset. You might want to check out your people more thoroughly. One great product! I bought 3 for my household and could actually get rid of 18 prescriptions bottles. I can definitely use one more. I go to them once a week at which time I take the weeks supply of pills and put them in my weekly pill holder. My only problem with them is that the labels don't stick very well. However, I took care of that by printing up my own label to wrap around the bottle and even listed the daily dosage and time of day to be given so that I don't have to keep checking the bottles for that information. As my mother is living with me and is on numerous medications it is a real time saver. I have even given this as a small gift and the recipients love it and want to know where they could get more! Don't have to open multiple bottles. Everything is in one place. Just don't drop it on a tile floor after you just fill it, more than a "52 card" pickup procedure!!!! I bought 2 of these about 10 yrs ago and never had a problem. We love ours. My husband and I plan to use this product for our vitamins when we travel. It is compact, easy to pack. I have 3 or these pill organizers One for me and one for him and one for vitamins It works great all the pills right there we keep ours on the kitchen table works great. And if you are traveling take all your pills with you I just put them in a cosmic bag with the zipper on top. They are made really well hard plastic and a nice tight snapping lid. Hey the price is right. My husband and I each have one. We each take so many pills daily and there are enough compartments for all of them. The container is easy to open and refill. I buy my medications 3 months at a time, dump them all in the organizer, then do not have to open 6 bottles when I refill my weekly container. I think it's a great, effective product, especially for seniors! My dad had one of these and I did too, mine wore out so now I have plenty for gifts and several for me to last many years. My hubby takes many pills and we had them in seperate bottles. This is awesome!! Much bigger than you think. We love it. I have looked for this for 3 yrs. My husband, myself, my sister and brother-in-law all use these containers for our meds and vitamins. We could only find the kind with holes in the top. Larger pills and vitamins wouldn't fit through the holes. great for anyone on mutiple meds especially when travelling and dont want all thise boxes of pills and your daily dispenser wont cover the trip duratiuon. We have a turntable to keep our medicines handy to set on the dinner table. We used to have the problem of the many plastic pill containers falling over and off of the turntable. This eliminates that problem. Also we can tell at a glance which pills are running low and need refilled. My son has had one of these pill organizers for many years. When he showed it to me, I started looking for one myself but had no luck finding one until I received my latest Miles Kimball catalog. These containers keep all my prescriptions and supplements organized and compact on my table. This is my second purchase of these pill organizers. I use them for my vitamins. I have one for "pm" and one for "am". Wonderful invention and couldn't do without them! I am definatly going to purchase 2 more. I use it for my six medications. No more fumbling with pill bottles and snap pill containers. I simply rotate the top over the next pill to take. Compartments are very large and hold the entire bottle of each prescription. Flap opening is large enough for even my larger pill. Going to use when I travel. I use the pill organizer every day. It's an easy, quick and non-confusing way to take medications and/or supplements. It is easy to fill and the labeling allows you to know exactly what you have and have not taken. I like the way the top is designed to rotate and open and close easily. I ordered a second one. With aging parents 200 miles away, I travel back and forth a lot. these pill organizers really help. I always know I have all my pills together & ready to go. I can also tell when the supply is running low. Used for my daily vitamins, all in one container! I've read some complaints about the lid cover being difficult to turn. I had that problem so I wiped some olive oil or coconut oil to the rim of the bottle and the rim of the lid, then snapped it back on and it's perfect! I use it for all my vitamins and think it would be better if it had a lid that was easier to close for seniors. I like the way it has sections ar we have a great deal of pills to separaate. I ordered 2 of these and looking to order 1 more. I love the way it keeps every thing in one area. I have a daycare and they cant open the container so I feel safe with that knowledge. This will be an excellent asset to take when we travel to hold all vitamins and prescriptions that we take on a daily basis. All my pills are in 1 place, labels show which are which. I have had 1 for over 10 years taking it on a boat down to Mexico, and bringing it back by car, each year. The older container is still usable, but couldn't pass up the sale. My initial purchase was for soft mints in patriotic wraps, and I saw these pill containers on sale. Holds a good supply of daily vitamin and minerals - easy to dispense. This has made my kitchen counter a lot neater. All my vitamins are now in one container instead of 5 or 6. Great way to take medications with you when traveling. Like that labels were included. Product is great! Much easier than opening 6 different vitamin bottles, just pop the lid and turn to each one! Buying a replacement since after almost 3 years, the flip top finally broke. This has been very useful since my family and I use it for vitamins every day, sometimes up to four times a day. For the money, this is a great buy!! Strickly for travel and will need to purchase more to eliminate all bottles. I bought this pill organizer and glad I did! I like the labels that come with it. It will be easier to use when we travel. This is a great pill organizer. They even include blank labels for each section. Never have to worry that I haven't taken all my meds! Cap is a little difficult to unscrew but otherwise it's a great investment. Vitamin organizer is great for travel. One can fit most, if not all of meds or vitamins in one-two containers. Stores easily too. Highly recommended for travel to weekly-monthly use at home. This is my 2nd pill organizer. My husband liked mine so much he asked me to order one for himself. His original organizer had an opening in the side of the lid. The opening was also smaller. With this one we can shake out even the very large pills with ease. keep all my every day meds in these. One container, 6 meds. With these I don't have to look for single bottles. Easy to pour small pills in but a little bit of a pain putting large pills in. I put the supplements that I take, in the morning, in one of the containers. I ordered two and one just didn't want to open. My son finally got it open for me and I used a little cooking oil and rubbed it on the cover. The tabs are very sturdy and kind of hard to pop open. Otherwise, I would order these again. Great getting all the different vitamin bottles off of the counter. Nice not having to open multiple bottles everyday. This is great for traveling. I no longer have to take a bunch of different pill bottles with me! I love this. Easy to use. Haven't used the product yet. Am happy with the size. Think it will be adequate for travel which is what I ordered it for. I take a lot of vitamins so it saves time. Lid is a little difficult to turn and take off. This is a great product and will reduce the number of pill bottles I will need to take on my next trip. Although the lid is hard to get off, it assures me that it will stay on during my travels. The labels were a great addition, however, unless I put look alike pills in the compartments, they really aren't that necessary. BUT, if you need to rely on someone else to administer your pills, the labels are a necessity. does what it is made for....it cuts out opening six different bottles everyday....and its a space saver.. Very handy item. Instead of putting all the pills in one compartment, I put the pills I need for the day in one compartment. Just spill them out. I think the little flip door on top of the lid will eventually wear off. Maybe we could get replacement lids? Thanks so much for being so prompt with this order. We have utilized these pill organizers previously. However, this time, one of our lids was cracked but we just glued it back together rather than shipping it back. Unfortunately, it has cracked again. I was using a two week/daily container but hated the hassle of filling each individual compartment. This is nice because it can carry a months supply (or more) depending on pill size. Wish it was just a little bit smaller though. I was looking for a replacement for an old container with dividers. This was just almost like my old one except the lid on my old one twisted and it opened on the side rather than the top. I was a little disappointed that this lid was so difficult to snap closed. It's perfect to hold vitamins because you don't have to reload it weekly like other pill dispensers. I would buy this product again if it were a bit smaller. I was aware that it was 4 inches high but not its diameter. Could be smaller to better fit in the luggage. There is one for each of us so its does take up a lot of room. This product is useful to us. It's great for knowing when to reorder. Opening a little hard for anyone with hand pain. I like it because all your medicine is in one container and do not have to open all those bottles to get my medicine out to take. Just pop the lid to open, take out the medication you need then past the last pill you got out and it will close. I like it so much that this is my second one for my night medicine. This is a great time-saver if you take more than 2 pills at a time. I plan to use this when I travel and in the bathroom. It takes up less space than all those pill bottles. The idea for this organizer is great but the lid is VERY hard to turn. I had one before that cracked and it worked well but the second one was almost impossible to turn the lid or to get it off. I ended up using 409 on the rim and it worked for awhile. I am ordering two more in hopes I just got a defective one. I like it, but it has some problems. The cover pops open when not in use. I had to bend the cover for it to stay. I'm not sure it will continue to stay closed. Other than that, I like this product. It was bought as a replacement for a very similar one. At first I was hesitant about this, it seems to good to be true. Iam now so glad I purchased it. I now have a more organized cabinet, and so much more space without all the medicine containers. After seeing mine, My husband has asked me to order one for him. I would buy again, works great. I have had mine several years and I only take my meds morning and night so I have my meds in order. The only problem is that the lid has broken off and they do not sell the lid only. I ordered 3 to replace the ones I bought a few years ago. They are very handy when it comes to storing vitamins. However, after a few years, the tab on top tends to break off from use, leaving a hole on the lid. That's when replacements are needed. But for the price and convenience, these pill dispensers are the best! We take our daily vitamin and several supplements with our breakfast. This product saves me time by eliminating the need to open six different bottles. this was to replace one that was 15 plus years old. The only difference is the old one had an inner cap that kept small pills in place. Example d vitamin in the new one end up in all 6 places, do not stay put. Overall very good, would but again. This product is pretty good. It is a little hard to open but that is for safty reasons I know. It is not quite big anf for a full vitumin bottle tho. But me and my grandmother love ours we finaly can keep our meds on the table so we can rember to take them. You only have to go to one container for all your pills. Easy to travel with. great time and space saver. only drawback that I can see is that if you change the pills in one of the compartments, it isn't easy to clean. I would recommend this pill container. I take a lot of vitamin-supplement pills so I have several of these. Getting the lid off requires a bit of strength but that's the trade off due to its high quality construction. The 6-Section Pill Organizer is something I have been looking for in stores. They don't carry them anymore. Sure was happy to find them at Miles Kimball. Great for organizing daily vitamins. Would like a larger one. Makes carrying my meds so easy! The pill organizer makes it so easy to keep my medications organized whether I use it around the house or take it with me on vacation. Everything is in one place, so I don't have to grab several bottles or medication to take with me. I just got back from vacation, and it was such a convenient way to take my medications with me. If the container was a little smaller it would be better. So I wish a smaller size was made in addition to this larger one. Easy to keep all pills taken daily in one compact place. I use one for prescription drugs, one for vits AM another for vits PM. Makes it SO much easier than opening/closing numerous bottles. Lables to name on container, as well. I have used these for YEARS & recommend for anyone who uses more than just a few bottles of any. Also use for craft items as well. Now others in craft/card group buy these for numerous uses. Thanks bunches. It took a lot of force and several hand tools to get the lid off this jar w/o breaking the plastic. I then filed the top ridge of the jar almost off and was then able to get the lid off with only a screwdriver. At first I thought it would be too big for my needs but am finding that it's OK. Like that it has so many compartments. I use it every day and will also travel with it. When the doctor changes medications the labels are short and I do not know how to replace them..I do like the jars because it gets rid of a lot of bottles. If you have any Ideas please let me know. I like having all my meds in one convenient place for when I travel, but find the top very hard to open. It only has one tab (two would be much better) and even my husband struggled with it. I looked all over for the SIZE (dimensions) of this before I bought it, but could not find it anywhere. So for those of you wondering, it is a little large, but it is 4 inches tall and 3 1/2 inches in diameter. Probably good if you are only using it for large type pills (vitamins, etc) but a little large for daily meds. But I will use it and it will still be handy for traveling. Worked great for a year but then started to gather vitamin dust and top wouldn't turn anymore. Going to buy 2 this time. Had to turn the lid. Convenient way to dispense pills. I find it very handy to have all of my meds an vitamins handy in two of these containers. They are easy to open with artheritic hands as mine. Product is so-so. Easy to pour small pills in, but not easy to pour large pills in, and the pills don't come out easily then. The lid difficult to take off. Lid the doesn't lock, so I can not take with me into a travel. This product just for daily use at home. This is a large container. Catalog did not list a size. I see now it is 4" high. Well, it is that wide, too, so you won't just tuck it into a travel bag! Study, well made. Bottle is great, but top cap doesn't shut. I had wanted something in which to carry pills in my purse. Normally, I take them before I leave the house, but not always. I'm tired of carring around a quart plastic bag with 5 pill bottles in it. Unfortunately, this is not much better. Yes, I know it says it's 4" tall, and I suppose I could have measured the image on the screen and figured out the actual size, but I didn't. Guess I'll just have to donate it and keep looking. I'm not a fan of the dump all you pills in a daily container and take them all. I want my pills separated and labelled. Has Potential...haven't used yet but ?? Great idea b/c it saves space and holds a variety of vitamins but the center divider isn't removable so there's no way to reach in there to dry each tiny section after washing/rinsing it! I've had several of these over the years and they all have the same problems. The little pop up lid breaks after use for several months. Otherwise I love the container. The product shipping was slow and when the pill organizers arrived one of the two I ordered was cracked. Even with the crack the item still worked and I was able to have all six of my medications and vitamins in one place which is great. The top to the pill organizer is cause for concern because it is not a screw on top and so there is no security that the top won't pop off randomly and all my pill will be everywhere. One of the tops was too tight and felt secure on the case but then wouldn't turn to allow me to dispense the pills and the other one was way to loose and would come off with the smallest gesture. Overall a great idea but not executed well with this particular piece. Thank you for your review. We are sorry to hear the Pill Organizer was received damaged. Please contact our customer service by email at aswechangecsr@silverstarbrands.com or by phone at 1-800-203-5584 and we can assist you further. We apologize for any inconvenience this may have caused. I had an old one of these that finally after 12 years cracked at the bottom. I was thrilled to finally see this in your catalog. I purchased 3--one for home, one for a vacation home and one for travel. My only complaint is the flip lid. With use, I am concerned the flip part will break off. My old one had a sliding lid. PURCHASED 3 FOR SELF AS I HAVE PURCHASED YEARS AGO, DID NOT HAVE THIS DIFFICULTY OF REMOVING TOP OR TURNING. It's too hard to get the lid on and off and the one you open above each compartment is hard to shut. I may send it back as I ordered two of them. I ordered a different pill holder that holds 14 days and snaps shut. Io have arthritis and this is hard to open and turn. I was hoping for something I wouldn't need help with. There is difficult to open the lid in order to fill. The flap on the lid will break after a few times of opening it.Other than that it is a good idea. At this point I can not say yes or no to the recommendation. The lid is nearly impossible to pry off to fill the sections, and the flip part of the lid never fully shuts after you remove your pills. Just poorly made! It is much bigger than it looks. I ordered it to use to carry pills with me, but it is way too big for that. I will look for a different use for this - maybe paper clips, nails, screws, etc. The top was difficult to turn, so had to return it. I ordered two of these, and they both arrived broken (they are made of plastic). They were packed in a box with only a single sheet of paper for cushioning. It was not worth it to me to go to the hassle and expense of packing and shipping them back, so I threw them away. Since Walter Drake won't pack its shipments properly to prevent breakage, I won't be shopping with them again. Sorry ... can not use them. Too hard to turn with arthritis. Purchased to replaced ones I've used for years. A big mistake ... things are too, too difficult to use. I had one of these that worked well but cracked. I ordered two more but found the lids impossible to turn nor can the lid easily be removed! A waste of money. Liked the idea of a convenient pill organizer on counter instead of all the bottles. Cheap quality that broke within a month. Too bad. I will have to start looking for something else. Great idea. Had others in past but this will not turn unless GREAT force is used. Think it's due to poor quality! Too large for what I wanted as a compact daily medicine container that could fit in my purse. Getting the lid off is a challenge. After receiving these (3 of them), I washed them and filled with pills. When I tried to turn the cap to dispense the pills, the cap would not turn. I used my jar opener and with much difficulty, I was able to gradually turn the cap a small bit at a time. Two of the bottles arrived with a crack in the side. I'm told they will be replaced. If the same thing happens, I will request a refund. the lid was almost impossible to turn. i think they used the wrong plastic for the lid and it shrank too tight. no older person will be able to use this. we cant. unless they change the lid dont bother. looks like a case of the manufacturer changed and did not build to the orriginal specification. i guess we now know why it was in the bargin bin flyer! the other reviews must have been for a diferent version of product. Low price and free shipping. DAILY DISPENSING OF VITAMINS AND SUPPLEMENTS. Had one before and liked it! Bought this to get rid of the handful of prescription bottles currently cluttering the counter. Have used this dispenser for about 10 years and they needed replacement because the hinge lid stopped working. I have been looking for dispenser for pills that held as many and organized for longer days. This will save time and make process SO much easier. Thank you!! I take multiple meds everday and this seems handy. I like to use these for my vitamins I take. Low price, website coupon, reputation of company. I have been using these pill organizers for many years. Unfortunately they do break after continuous use. However, I still enjoy using them to organize my pills. I recommend them. It appears to very efficient way to store meds . I'm on numerous medications...this is perfect for organizing them! Best price and free shipping!! I love "FREE SHIPING"
I take many supplements throughout the day and need to organize them to save time. My wife and I have been using five of these pill containers every day for more than seven years, They have served us very well. Two of the organizers work just fine. The other three have lose fitting access doors on top of lids and the lids are lose fitting on the containers pill holding bottoms. These containers have been dropped many times and moved frequently around the country with us. Tired of opening 6 bottles of vitamins every morning. This will be more organized. Previous good experience, but accidently broke what I have. Looks roomy with easy access to compartments. I have been using this type of organizer for over 20 years. The Progressive vitamin dispenser changed a while ago and no longer accommodated higher count mg supplements. This organizer allows easy dispensing and refill of the large pills. my husband has several and it keeps his pills very organized.. This is the only pill container that will accommodate several weeks of pills. It is just easier to dispense from this container than using the individual pill bottles. BEST ANSWER: Thank you for your question. This item is 4" tall. We hope this information will be of help to you. is this cylinder, pill dispenser a twist on-or-snap on lid? BEST ANSWER: I would have to say that it's a snap-on lid with a section that lifts open to dispense your medication/supplements. Thank you for your question. The lid is a snap on lid. We hope this information will be of help to you. The lid snaps on and it is quite secure. it comes with tags to write on, or they are fixed? BEST ANSWER: Thank you for your question. Yes the pill organizer includes 7 blank labels that can be attached to the bottle. We hope this information will be of help to you. It has tags to write on. I see 4" tall, how wide is it? •3 ¼” wide at the bottom. •3 ½” wide at the top. How many pills does one section hold? about 50 capsule size . My husband and I like that the size is great for all meds. How large is the hatch on top? Some of my pills are rather large. BEST ANSWER: it is,definitely wide enough to fit even the largest of my pills.